The Maastricht School of Translation and Interpreting is a language academy of the Zuyd University of Applied Sciences and offers one of the most advanced and cutting-edge translator training programs that we have ever come across. We had the opportunity to interview Joop Bindels who leads the program’s simulated internal translation agency to gain a better understanding of what makes their training so remarkable. Joop started at Maastricht in 2014 as a teacher of CAT tools and now also teaches French to Dutch translation. He leads the Zuyd Vertalingen, an internal translation agency that is completely run by students: the center of this article. To further enhance the training, Joop integrated the Memsource Academic Edition in February 2015. 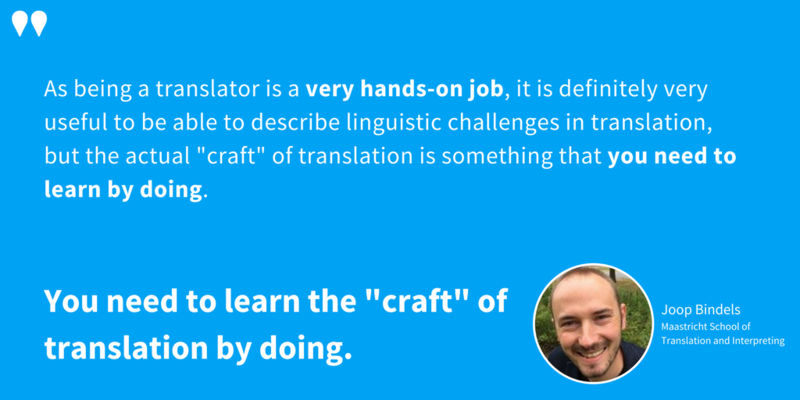 “Being a translator is a very hands-on job, it is definitely very useful to be able to describe linguistic challenges in translation, but the actual ‘craft’ of translation is something that you need to learn by doing,” Joop said. He puts his words into action by making the Maastricht training highly practice-oriented, with the goal of fully preparing students for the real translation market. It’s proving to be very successful: “Most of our students become (freelance) translators, some become project managers, some start their own business and some go on to study for a Master in translation, interpreting, or literature,” he said. Joop was kind enough to give us a glimpse into what the practice-oriented training looks like. “First of all, students translate a lot—there’s a lot of actually doing translation instead of learning about doing it,” he said. The assignments are as “situated” as possible, which means that they resemble the projects students would receive if they were professionals—they have context, purpose, target audience, a specific client, required terminology, and so on. Interested in learning more about situated translation training? Check out this paper on situated translation written by lecturers from the Cologne University of Applied Sciences. Apart from that, students use CAT tools to work on those realistic assignments, take on the role of a project manager from very early in their training, and go through a number of different internships and work placements. During the second year of their studies, all students are required to visit a translation agency for a day. In their third year, they leave the Netherlands to work abroad for five to six months, and finally, in their fourth year, they go through an eight week long full-time internship at a translation agency or a translation department of an international company and take part in the Maastricht’s iconic Zuyd Vertalingen simulated agency. Then comes the most important point. Zuyd Vertalingen is completely student-run, Joop only supervises. “I am the fictional CEO, or coordinator. The numbers differ each year, but now we have 18 students working there and quite a large management team made out of 5 students. For these management positions, students have to apply beforehand and they have to undergo an interview with me and a colleague of mine,” he said. The simulated agency has an office manager who leads the day-to-day management in the agency, two assistant office managers working part-time and also translating and revising, an IT manager, and a recently added PR and communications manager. Students can re-use some of the materials their predecessors have created, such as the website layout or certain procedures, but most of the time they start from scratch—all the way down to blog and social media posts—so they gain experience in the marketing and business side of a professional translator’s career as well. Business coaches and other external experts are also invited to talk about people management, achieving goals, or the revision process with the students. Some lecturers also take on roles to prepare students for different kinds of clients, and students constantly receive feedback from them. Interested in how this unique approach started? Read a paper written by its creator. “Also, we are currently professionalizing the way students take on real assignments. Some of them come from inside the university—like if another faculty wants to have something translated—but some even come from external vendors.” This way, students can experience what real translation and project management feel like. What does this all mean for the students? 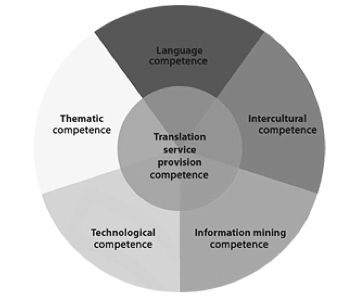 Thanks to such an innovative and elaborate approach, students are trained in accordance with the official competence framework defined by the EMT Expert Group, a group of experts summoned in 2009 by the EU’s Directorate General for Translation, responsible for creating a standard framework for professional translators. To learn more about the different competencies, refer to the paper published by the group. Thanks to all this, students of the Maastricht School of Translation and Interpreting can be sure that they receive a thorough training that not only provides them with theory but also trains them in the actual work they will have to do during their professional careers. Looks like the program can’t get any better, right? Wrong—it can. Instead of keeping the effective approach to themselves, Joop and his colleague, Gys-Walt van Egdom, try to spread their ideas via the International Network of Simulated Translation Bureaus so that other universities can follow the steps to implementing their own program. “INSTB offers great opportunities to translation study programmes that are looking for ways to more effectively prepare students for their future in translation,” Joop said. There are currently 11 universities participating. If you are interested in implementing such an approach at your university, there is nothing easier than to contact Joop Bindels directly. All in all, Joop and his colleagues from the Maastricht School of Translation and Interpreting provide students with top-notch training aimed at making them sought-after professionals who will have no problem navigating the translation industry—we at Memsource love to see such an interesting practice-oriented approach, and are really happy to be able to help with establishing it. It’s a win-win situation. Filip Šanca is the Academic Account Manager at Memsource, working with translation professors and students participating in the academic program around the world. He is currently finishing his master’s degree in Serbian philology at Charles University. If you would like to take advantage of Joop’s experience and enhance your courses, do not hesitate to send Filip a message at filip.sanca@memsource.com.